Excel Church - Helping God's People Excel - L.A.B.S. comes to YOU! Our weekly time of study is so important to our spiritual growth and development that we have made a move to make it more accessible to all the members of our church. Now, you can sit around the kitchen table with your family, grab your bibles and a cup of hot chocolate, and delve into the word of God with Pastor Alicia (aka ladypastorpreneur) online. This is an awesome evangelism opportunity as well. By sharing the Facebook Live post on your timeline and using the 'invite Friends' feature, you can join us in spreading the gospel! Pastor Charles and Pastor Alicia are so excited about what this will mean for our individual and corporate growth! Feel free to share this article and start evangelizing today! 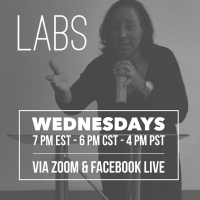 We can't wait to see you and your family on Facebook or Zoom every Wednesday night, and we look forward to seeing you excel!